Uruguay has 12,108,000 cattle and 33,68,595 human. The ration of cattle to human is 3.59. 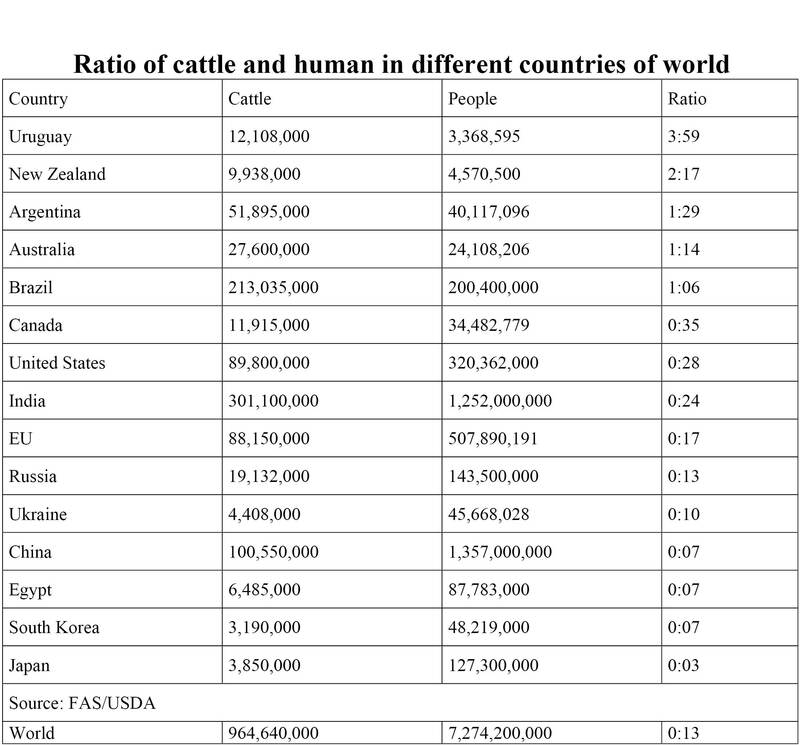 Whereas India has a ratio of 1 to 0.24 means human are more cattle is less or say there are four humans for a cattle which is a reserve of Uruguay (Per human there are 3.5 cattle.) In New Zealand the human population is 4.5 million and cattle population is 10 million and cattle population is 10 million so approximately there are two cattle per human. In Argentina there are 40 million human populations and 52 million cattle (Radio 1:1.3) In Australia and Brazil human and cattle population is approximately the same. In India there 300 million cattle and buffalo and less than human population is 1250 million (1:0.24). So there are four humans per cattle. When we compare land then India has 3 million sq kilometres and Brazil has 8 million sq kilometre. Australian has 17 million kilometres and the United State has 9 million kilometres. America is producing milk from 10 million cows we produce milk from 200 million. Average milk production of milk in America is 30 kg/day. Our milk production is a 2-3 litre. We do not raise the cattle for meat. But in America and other beef eating countries 60% of cattle are raised for beef and 40% milk, Petrol production countries import beef and milk producing animal from. Europe, America, Australia. America. India is the largest beef exporter and we export beef to Vietnam.